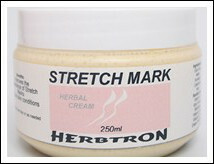 Our Stretch Mark cream improves the appearance of stretch marks. Improve skin conditions. Ingredients: Gotu Kola, Vitamin E, Aloe Ferrox, Flaxseed Oil, Lavender and Grape Seed Oil.